Ideas for incorporating the improv "yes and..." philosophy into your library practice. Please share your experiences, comments, ideas, and games for using improvisation techniques in the library. How do you begin a sentence with "me?" That was one of the many questions posed by library staff from Black River Falls Public Library and Sparta Public Library. Sometimes it requires suspending the rules. Through improv games and practice, we explored ways of saying no without saying no, strategies for active listening in public service environments, identifying and using the resources and skills we have to solve problems, and more. Many thanks to the two libraries for hosting, organizing and inviting me. I tell ya, public library folks are doing good and important work. Visit them. Thank them. Librarians from the Mid-Atlantic Library Alliance (MALiA) played it SAFE (Suspend judgment, Accept all offers, Focus on the others, Embrace failure) at their annual meeting by playing with improv ideas. Activities focused on exercising spontaneity, active listening, and thinking in unconventional ways. One game -- I call it mashup -- elicited some fun, interesting, and even doable library programming. Each group was given a challenge, something someone cared about, and a special skill (all generated from participants). They then mashed these 3 prompts into a single program or event. The results ranged from entertaining to completely doable. How about enlisting the Weeding King to rid people of their bad habits? Or how about creating an Empathy hotline for people frustrated by their friends' lack of book and film knowledge? What about a library event in which senior citizens create collages of their homes and share their memories? How about a student-run coffee shop teaching students about financial management? It was a fun day meeting new colleagues and learning about the good and important work they do. Thanks so much, MALiA librarians, for inviting me and for the hospitality! Want to shake things up? Get your students, or colleagues, or yourself -- especially yourself -- thinking outside the box? Want to increase your comfort with ambiguity and change? Want to incorporate more fun and joy into your work? Join the libraryimprov facebook group to share ideas and resources on bringing improv techniques and philosophies into the library. Recognizing that I am surrounded by talented colleagues with a wide range of interests and skills, I have long thought about having a 'hidden talents' conference -- a day long conference during which library staff would do sessions presenting or teaching or performing or whatever.... This summer it finally happened. We threw our first McIntyre Library Summer Conference. Our eclectic program included belly dancing (yes!) and document design and self defense and blues music and book crafts and cake decorating and pizza and improv! We had a great time. We all learned and experienced something new and unfamiliar. It was both uplifting and humbling to observe colleagues sharing their passions and abilities. I hold my colleagues in such high esteem, not only for their willingness to share their expertise but also for those who stepped way outside of their comfort zones to attend and participate in the sessions and just go with it and be supportive of each other. Now that's improv! As my library embarked on a strategic planning process, there was some skepticism. These endeavors in the past had been painful, tedious and ultimately ineffective. We'd make plans, but then external forces would intervene, there was never any money, and the plan was shelved. This time we are taking a new approach to the plan, and to give everyone an opportunity to vent frustration and skepticism of the past, we included an activity we called the anti-strategic plan: releasing our un-values. Provide a prompt contrary to your values. Ours was: "The library is a research environment that maintains the exclusive and inaccessible nature of information." Have group brainstorm values to support this prompt. Talk about the cathartic nature of releasing previous negative experiences and connotations of process. I got several positive comments about this activity after our strategic planning kick-off meeting. And it was a lot of fun. After we got going, it was hard to stop, and it did allow us to confront the negativity head on and move past it. We can start a sentence with 'us' but don't ask us to list our favorite books! When you see 'improv' on a library conference program description, it can be intimidating. But several brave souls on the lovely UW-LaCrosse campus resisted the temptation to bolt and decided to give it a try. And it was fun, wasn't it?! Said one attendee afterwards, who was nervous about her own presentation coming later in the day, "I feel more relaxed, more spontaneous." Following a keynote presentation on building strong teams, we played improv games that help develop some of those characteristics of effective teams: developing trust, a positive and constructive attitude, deep listening, supporting the team, moving beyond conventional thinking and having some fun. 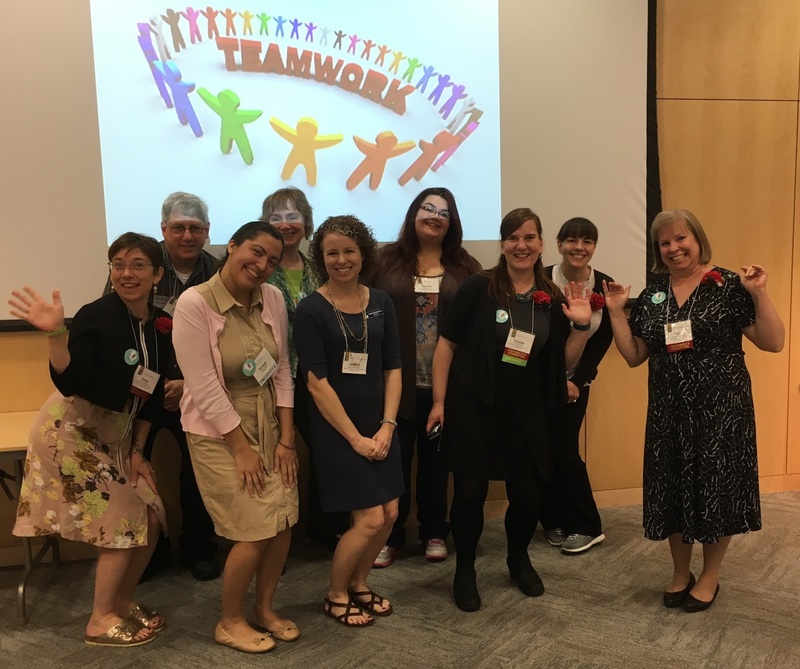 Way to go, Wisconsin Library Association Support Staff & Circulation Services Conference attendees! If anyone can start a sentence with the word 'us' under pressure it's these folks. Just please don't ask us to list our favorite books. Dennis, Rea. (2014), Improvised performance: nurturing natural leadership, Journal of organisational transformation & social change, vol. 11, no. 2, pp. 108-124.
du Plessis, Hannah. (2014). Improv: a way to design in uncertainty. Kay, Katty, & Shipman, Claire. (May 2014). The Confidence Gap. The Atlantic. Rossing, Jonathan P., & Hoffmann-Longtin, Krista. (June 2016). "Improv(ing) the Academy: Applied Improvisation as a Strategy for Educational Development," To Improve the Academy. 35:2, pp. 303-325. Thiagarajan, Sivasailam. (2006). Thiagi's 100 Favorite Games.